Bass rule. That's just all there is to it. Trout are fun, sure, but they just can't compete with a hoard of hungry, menacing, bent-on-destruction bass. Fished for several hours on the ponds at Barnsley Gardens today and had a ball. I started out on the ponds below the horse stables and on the Woodlands pond, picking up a few dinks here and there. About an hour before dark I headed up to the lower golf course pond and it was ON. I found a pocket of water where some largemouth bass had corralled a few schools of baitfish and were absolutely hammering them. 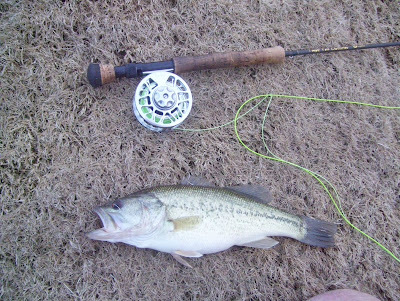 I tied on a streamer and stepped into bass fishing heaven. Have no idea how many I caught, but there were stretches where I got strikes on every cast. The strikes were violent and aggressive. Sometimes there would be a wake behind the fly as the bass drew a bead on the target and started his rush. Awesome. Freakin' awesome. The bass looked like footballs, thick and heavy-bodied, and fought like demons. The largest of the bunch were around two pounds or so, nothing to brag about but more than enough to put a nice bend in the old 7 wt. Even caught a couple of slab crappie that had joined in on the baitfish massacre. This went on until the sun was down and darkness set in. I hated to see it end. Bass rule.